Some of the priciest real estate is waterfront homes. And that means there are many expensive homes in Florida! However, even waterfront homes vary widely in price. Consequently, you obviously see big differences in a waterfront home listed on the market for $2 million versus one listed at $50 million. Take a look at this incredible estate! Let’s dream for a bit about this gorgeous mansion. It’s only one of many Florida mansions, but one that certainly stands out in the crowd! 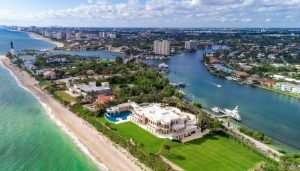 This paradise mansion is located in Hillsboro Beach, Florida, a 4-hour drive south of Palm Coast, along the A1A highway, just north of Miami. Many of the homes sold on the Hillsboro Mile are priced from around $3 million to $30 million. 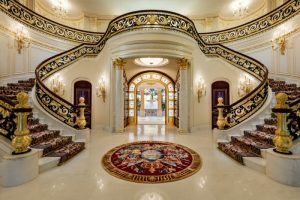 Conversely, “Playa Vista Isle,” a five-acre Versailles-inspired mansion, lists at $159 million! “Playa Vista Isle” is one of the most expensive homes for sale in the U.S. 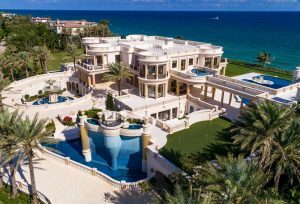 It was considered “THE” most expensive home in the U.S. in 2015 by the South Florida Business Journal. Also, Forbes listed it as one of 18 homes priced over $100 million in 2017. Imagine walking into THIS after a long day at work! Playa Vista Isle is a marvel with 17 bedrooms, 22 bathrooms, and two docks that accommodates two yachts. It also has a 20-car garage with tunnel access. Additionally, the mansion boasts a 4500-square-foot infinity pool, 6 waterfalls, and is detailed throughout with 22-karat gold leaf gilding. This mansion was completed in 2018 and put up for auction in November 2018. Well, here’s a plot twist: Because Playa Vista Isle was sold via auction, there was no reserve, which means the property sold to the highest bidder, with no minimum bid or reserve price. Consequently, ‘Teavana’ co-founder Andrew Mack paid “only” $42.5 million for the mansion. This is slightly more than only a quarter of what the mansion is worth! So, perhaps you can’t afford a home on Millionaires Mile, but you still want luxury? 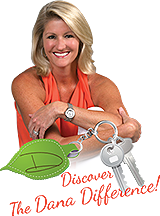 Check out my blog, “What Luxury Home Buyers Want” and contact me to review your wish list. I can help you find your home in paradise — and it doesn’t have to be along Millionaires Mile — without such a hefty price tag, either!